Generally, when playing pedal passages from repertoire composed after 1800, the premise of playing it in a uniform legato using toes and heels in combination is good. It can be very tricky, however, trying to make this premise apply to every situation. A case in point is the opening passage from the Toccata from Suite Gothique, Op. 25, No. 4, by Leon Boellmann (photo). 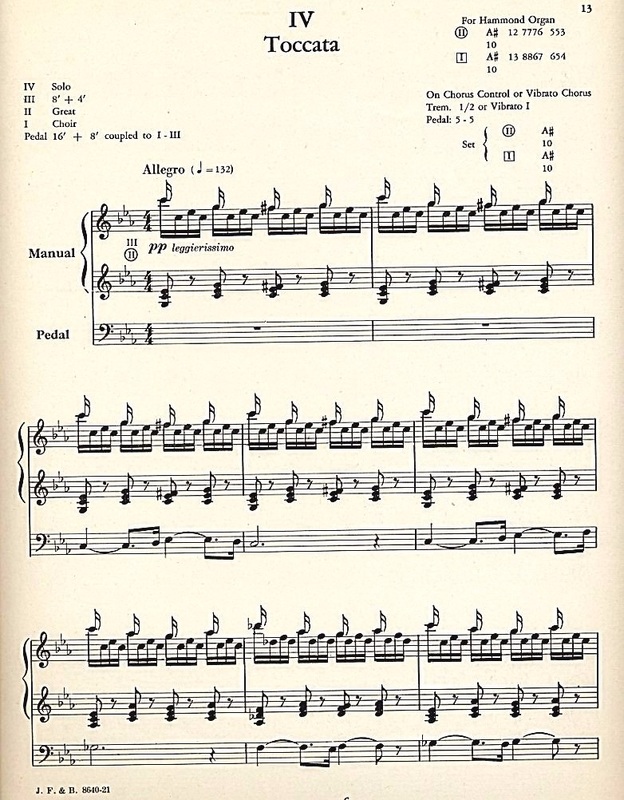 This famous work is highly effective at captivating an audience and not fiendishly difficult to play, the "T figure" (toccata figuration above the pedal) lies pretty much under the hands, but a certain control has to be exercised to perform the pedal theme exactly as indicated in the score, to get it right. This pedal theme enters on the downbeat of the 3rd measure (photo), and on the second beat of that 3rd measure we find a dotted quarter note followed by a sixteenth note. It's been the observation of this writer that, when listening to this work performed, time after time, it's often played at such a fast concert tempo that the 16th notes in the pedal theme don't always come out as written. It can happen, that they come in a barely appreciable trifle too soon and sound more like the 3rd note of a triplet group with the first 2 triplet notes tied to the preceding quarter note (instead of sounding like a 16th following a dotted quarter, as indicated in the score). At first glance one wouldn't think a little thing like this would matter all that much, but lengthening the duration of these 16th notes even by this slight amount and disturbing the legato by lifting the feet off the pedals in certain places to insert rests changes the character of the theme completely, and its proximate cause can be related to the use of the right heel in playing these same 16th notes. When these 16th notes start too soon it's not something that can be counted readily, but the ear can detect it. The way the composer notated it, it should sound like the first note C glides legato immediately up to the 3rd note Eb, and the Eb then glides legato immediately up to Gb, as if they were passing notes in a short glissando. With the exception of a few brief rests written between notes within motives and to indicate the breaks between phrases, no other articulation whatsoever is written into the score for this pedal theme, meaning that the composer wanted legato with no articulation (breaks) between notes. By notating it the way he did, the composer wanted the strongest emphasis to come on the notes C, Eb, and Gb, the diminished triad upon which the theme derives all of its harmonic interest. He indicates this emphasis in the score by keeping these 3 notes in longer note values in the theme, writing them on the strong beats, and working these notes into the left hand chords on the strong beats as well. Therefore to be true to the score and stylistically authentic the 16th notes should be played legato by the feet and very quickly, but we know that there are limits to how fast the human ankles can react to the commands given them by the brain. This piece stretches those limits to their extremes when the tempo is fast and the heels are employed on D and F.
Even when they start it correctly (which they most often do not), not one virtuoso organist in 10 gets this right all the way through ... and a lot of it stems from the fact that they take the tempo way too fast from the get-go. The score is not marked Vivace or Presto as some organists seem determined to perform it (some even play it Prestissimo, as fast as possible). The composer's tempo mark is "Allegro," which means lively, not tornado speed. Therefore we have to settle on one way of playing these pedal notes, depending upon personal taste, and stick to it. This writer (who's a clarity guy) prefers a steady, lively but not too fast, concert tempo for this work which enables him to get the duration of those 16th notes in the pedal theme legato and exactly as written. In this example this writer prefers the left heel on the first note C, the left toe on the 3rd note Eb, and the right toe on the intervening note D; he then takes F with the right toe and Gb with the left toe, playing these notes for the right foot (D and F) extremely quickly. Many editors, following the premise of using heels, toes, and legato for pedaling organ music composed after 1800, have provided pedaling indications for this opening theme by specifying the right heel for those 2 quick notes D and F.
While the premise may be good, in this situation trouble can arise in that the right ankle isn't always fast enough, and it's just too easy, when trying to employ the right heel on D and F (notes which the composer wanted held for almost no time at all) to play those pedal keys sooner in order to get to the note above them on time. This might also arise when only the left foot is used to announce the theme; if the left heel takes D and F legato it must slide quickly forward on these keys in order for the left toe to take Eb and Gb; this requires superhuman coordination to keep the left heel from holding that D and F too long. For this writer, it's just a matter of desiring the most control as it works with the human ankles and feet. Organists are all wired differently, but, in some situations like this, it may boil down sometimes to coordinating the tempo with greater use of the toes in Romantic and Modern organ music to get certain fast 16th notes like this to come out exactly as written on the page. As stated above, this can have us at a tricky place in certain pieces like this one as we try to settle on the pedaling indications that work best for us as the tempo of a work is increased during the practice period. Some experimentation is required ... and what works in one application may not work in another. This writer also finds it works best for him, when the pedal theme returns in octaves later in the work, to pull out ... slow the tempo down just a bit ... at the return of the theme to give the lowest pipes a split of a second more time to get on speech and to get those 16th notes on D and F legato using both heels. They have to be played very quickly to get them right ... NOT played at double or near double value. Wearing conventional street shoes lacking an elevated heel requires more ankle movement to get these big pedal octaves to play in tempo, whereas an elevated heel makes pedaling more deft because there is less ankle movement, heel to toe, especially in rapid passages [See blog, Shoes, Parts I-VI]. And so, by practicing this piece in street shoes having a shorter heel the 16th notes on D and F often start a barely appreciable trifle too soon, and when it's practiced this way, over and over, the performer's ear gets used to hearing it with this built-in flaw. It becomes too easy then, to automatically play these 16th notes the same way wherever else they may appear in the score. If and when this happens, the performer is no longer playing the composer's piece; they're playing their own commentary on it. It's important therefore, to play close attention to the note values in this or any other theme, do whatever is necessary to get those note values to sound EXACTLY as the composer notated them, and adjust the tempo to accommodate it. The educated ear, just by hearing the opening tempo of this work, can tell by the 2nd measure (before the theme ever enters in the pedal) if the performer will manage to be true to the composer's score.